Australia has ruled out starting talks on a trade deal with the UK before we formally cut ties with the European Union. Under EU rules member states are banned from signing their own individual agreements with non-European nations but Britain’s International Trade Secretary Liam Fox had hoped to line up deals for the UK to sign as soon as Britain cuts ties with Brussels in the spring of 2019. 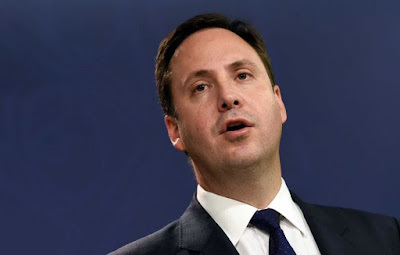 In a blow to his plans, Australia’s trade minister Steven Ciobo said today he has been given advice that even starting talks over a future deal would be illegal. However he added that Australia will negotiate a deal with Britain ‘as efficiently and promptly as possible‘. And in a boost for British travellers, Mr Ciobo announced plans to make it easier for Britons to secure ‘working holiday visas’ to Australia. He hosted a pop-up beach with Made in Chelsea star Lucy Watson today at London’s Victoria railway station to promote Australia as a destination for British youngsters. The new package of measures aimed at enticing more British youngsters to emigrate to Australia includes a reduction in the working holiday visa, a cut in the tax rate and proposals to extend the age limit so British citizens aged up to 35 years can travel on the visa. Currently the visa program allows British citizens aged between 18-30 to work in Australia for up to two years. There are currently around 40,000 Britons who take up the visa every year and a survey published today found that more than half (52 per cent) of British youngsters aged between 18-24 are considering a temporary move abroad – an increase since June’s Brexit vote. Reports in the Times said Australian officials privately want the UK trade deal to include measures to allow privileged access to Britain’s labour market for Australian workers. And they also want the deal to allow Australian financial service firms to expand in the UK. 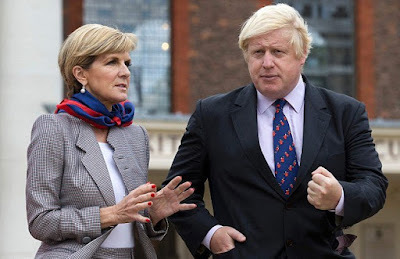 But revealing that he had been warned against starting trade negotiations with Britain until it had left the EU, Mr Ciobo said: ‘That is the legal advice we have had. Promoting Australia’s working visa scheme today, Mr Ciobo said: ‘An Australian working holiday is more than just a job, and more than a holiday. Our country offers so much. ‘It is a beautiful and unique destination where you can work, live and have adventures every day. A year, or maybe two, travelling and working in Australia will change your life. ‘I’m delighted to be in the UK, Australia’s biggest market for working holiday maker travel, to encourage more young Brits to travel down under. With recent changes announced to the program, a working holiday in Australia is now easier and affordable.